The Awesomism process focuses on establishing a new understanding of the autistic child in your life. It helps you establish H.O.P.E.—a new paradigm of relating to your child by being Honest, Open-Minded, Present and Excited—and to discover the simple yet profound concepts and ideals of Awesomism. Awesomism is knowing your child for who they really are, complete with the amazing clarity, wisdom, and gifts they bring to your life. When confronted with a diagnosis for their child of ADD, ADHD, or autism, most parents simply look for ways to manage the child’s behavior or have the child “fit in.” Our purpose is to help you understand, through Yoga Therapy, the higher aspects of your child and how they play out in the child’s daily life. You will come to see that your child is a blessing to be marveled at and not simply a set of problems to manage or fix. Yoga Therapy facilitates the interaction and understanding between you and your child, and helps harmonize and balance the mental, emotional, and physical energy bodies. Yoga Therapy helps you understand how energy works and its impact on children diagnosed with autism and on all energetically sensitive children. Awesomism is the deep inner shift that restores your trust in yourself, your child, and your significant relationships. It is seeing outside the “disorder” to the brilliance of your child’s difference. Awesomism is an opportunity to move beyond limitation and into potentials and possibilities. It’s a powerfully positive way to experience autism and is the paradigm shift you need to love your life again! 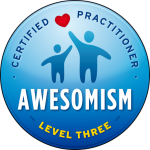 Please contact us for more information on becoming a Certified Awesomenism Practitioner or for Awesomenism sessions and tools for your child and your family.